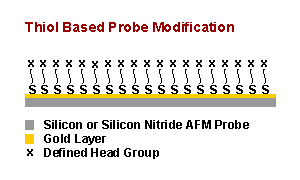 The Probe and Surface Laboratory at Novascan Technologies offers AFM probes with defined chemistries useful in a number of AFM applications including chemical force microscopy (CFM). These probes have proven a powerful tool for characterizing surfaces, studying molecular forces and chemical sensing. 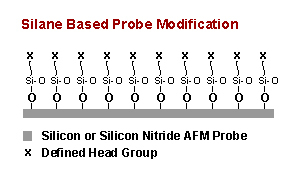 Chemically modified probes are comprised primarily of either thiol-based or silane-based self assembled monolayers (SAMs) covalently attached to the surface of commercially available AFM probes. Thiol modified probes, available with CH3, COOH, OH and succinimide end groups, are attached via chemical absorption to a freshly applied layer of gold. Alternatively, silane monolayers, including APTES, are tethered to oxide layers on the surface of AFM probes. Further modifications can yield a variety of surface chemistries including NH3, maleimide, biotin, streptavidin, neutravidin, antibodies, PEG linkers and a number of other molecules. Many of these modifications can also be performed on probes that have previously been modified with the attachment of SiO2, borosilicate glass or polystyrene particles. As is always the case at Novascan, we welcome the opportunity to discuss custom modifications including custom particle attachment or chemical modifications. PT.PE - Polyethylene Particle - please enquire for sizes. Note: These particles are quite soft.